The descent to Khado Valley - an inhabited valley deep within the Gudauri Ski Resort surroundings - is a breathtaking adventure. From the beginning of the route via a ski lift, to giant and diverse descent lines, to more than one kilometer of vertical drop, to stunning views and the opportunity to observe life in a remote mountain village, this route is one of the most interesting in the region. 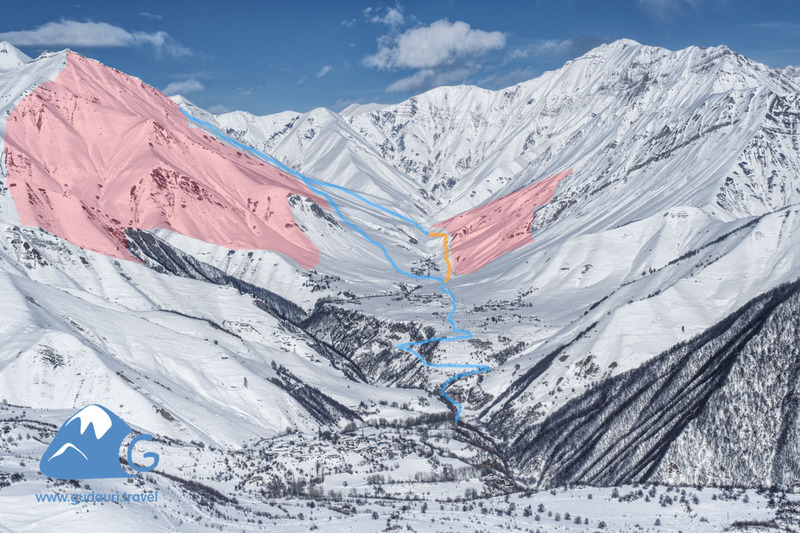 However, an increased avalanche danger and a longer return to the resort (in comparison with other routes that also start from a ski lift - Kobi, Bidara) become constraining factors for freeriders. Descent begins right from a ski lift. There is a large selection of ideal lines, incredible views, and an atmospheric location – these features make this route the best way to experience this mountainous region in only a few hours. Khado valley is located to the east of the Gudauri Ski Resort, immediately after Chrdili Mountain, the most popular spot for freeriders. There are several variants of descent, the safest of which begins at the peak of Mount Kudebi (at the end of a ski lift of the same name). Ski descent ends near the village of Tskere, where you will need to travel a few kilometers along a large, flat site to the very bottom of the valley, where a car can reach you in order to bring you back to the resort. The steepness of the slopes is up to 30º. In wintertime, several families live in Khado Valley, and they are in fact isolated from civilization, as the major part of the only road is covered with snow. This is a one-day route, and you need a couple of hours to return to the resort after the descent. Every year unlucky tourists find themselves in Khado Valley. These are solo freeriders who accidentally arrive into the valley in conditions of poor visibility while going off-piste on Kudebi Mountain. Sometimes they come to Khado Valley deliberately without realizing the dangers of the chosen terrain and that there are no taxis available in this region to return them to the resort. Fortunately, despite a great avalanche danger of the eastern and south-eastern slopes, there have been no. fatal accidents. The route is potentially dangerous due to thawing, steep slopes, the presence of terrain levels, the complexity of navigation in conditions of poor visibility, and so-called "terrain traps." If possible, avoid the descent through well-pronounced terrain depressions and ravines – try to choose a descent line along the edges of the slope. Certainly, this route is not recommended for independent passage by riders without corresponding experience. Normal Ski / Solid Snowboard. The lower stations of any lift in Gudauri open at 10:00 (09:00 in April). To get on the route, you need to take lifts to Mount Kudebi (see the map of pistes). From the upper station of Kudebi, you should go 200 meters to the top of the mountain to the cross. The beginning of descent is from this cross. You can return to the resort by taxi. After descent, when you’re at the bridge, call the driver and ask him to pick you up at Khado. The standard cost of a 7-seat car to meet you in Khado Valley is 100 lari, and the journey time is 40 minutes. The descent begins at the cross on the top of Mount Kudebi, reachable via ski lift. The choice of descent line depends on the stability of the snow cover on the eastern slopes. You can descend immediately into the ravine along a well-viewed descent line into the valley, or in the case of stable snow cover, you can descend 200 meters on the shoulder. You can then ascend to the southwestern peak of a 2860 m height (GPS coordinates 42.49344, 44.51550) and choose a descent line to the east or southeast from there. At an altitude of 2,200 meters, the slope begins to flatten a little bit – cross the ravine here and keep to the right of it, continuing down the slope but traversing to the south in the direction of the village. At the end of the village you can see a bridge, and when you cross it you will get to a snow-covered road. Following the road’s contour, it is necessary to continue the descent for about 4 km on a flat site. The route first goes through picturesque villages and passes by a church, and then it continues near a mountain serpentine to the right and to the valley. You will finish this route in 1,5-2 hours. If there are already tracks on this route, it will be possible to get to a car faster by following them. At the very bottom of the valley, 200 meters from the bridge on the left side, there is a mineral water spring (GPS coordinates 42.45065, 44.52840, height 1510 m). It is noticeable by red traces of mineral deposits on the rocks. This is a good place to wait for a car. In winter with little snow cover, cars can reach here, but in snowier winters the car will wait for you 200-500 meters further down the road. The whole route is ridable; splitboarders need telescopic poles awhile traveling to the car pickup area . In the lower part of the route there may be stones that can damage skis or snowboards.